The BMW M2 has become one of the most hyped cars of the year, and demand has definitely been high. It is hard to argue that the BMW M2 isn't as close to a perfect package as you can find on the market today. Its closest competitor (in the US) is the CLA45 AMG, which may be more powerful and less expensive, but can by easily optioned to cost way more than the M2. Plus, the CLA isn't really as pure a driver's car as the M2. So far, the M2 has been dominating without much competition, but Audi is finally ready to join the fight. If you live outside of the US, you have been able to buy an Audi RS3 for quite some time, but the US market is never quite the same. 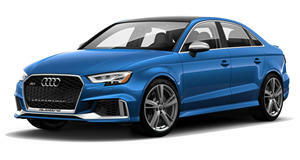 Oddly enough, the only hatchback version of the A3 that Audi sells in the US is the E-Tron, all other A3/S3 models are either a sedan or convertible. Audi was long-rumored to be working on an RS3 for the US market, but we knew that if the RS3 ever did reach our shores, it would be a sedan. Our wait finally ended at the 2016 Paris Motor Show where the RS3 sedan debuted. 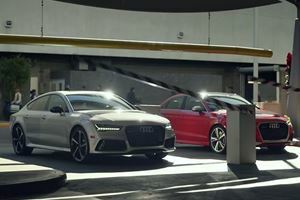 The RS3 will join the RS7 as the only RS-badged cars in the US. In Europe, Audi has many more RS cars that compete with BMW M and Mercedes AMG, but the US has mostly been left out. So how does the new RS3 stack up against the competition? The RS3's 2.5-liter five-cylinder puts out 400 horsepower through a seven-speed dual-clutch transmission. The CLA45 has a 2.0-liter four-cylinder that puts out 375 hp, also through a seven-speed dual-clutch. According to the manufacturers, both cars have identical 0-60 mph times of 4.1 seconds. The M2 has the largest engine, a 3.0-liter inline-six, but has the least power at 365 hp. The M2 is also the only RWD car of the three, and the only one that is available with the option of a manual transmission. Astonishingly, according to the manufacturer, it also has a 0-60 mph time of 4.1 seconds. These cars couldn't possibly be more similar. So, what does separate these three seemingly identical cars? Well, each car offers a very different body style. The M2 is a two-door coupe, which is the sportiest of the three. If you're willing to sacrifice practicality for looks, the M2 may be the right car for you. The CLA45 is what is known as a "four-door-coupe," meaning that it is styled to look like a two-door, while still having the practicality of a sedan. The CLA is a bit more practical than the M2 because it has rear doors, but rear headroom is not great and the back seat is very tight. The RS3 seems to be the most practical of the three, although we still think that the hatchback RS3 would be the best option. We bet that as soon as the RS3 gets tested, the 400 hp and 4.1 second 0-60 claims will be completely discarded. Audi has a habit of severely underrating its engines. Audi rated the S8's 0-60 time at 3.9 seconds, and MotorTrend tested it at 3.5 seconds. 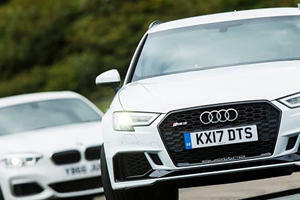 We have no doubt that when the RS3 gets tested against the M2 in a straight line, it will blow the doors off the BMW. Where we have less confidence, is how the RS3 will perform against the M2 on the track. Even if the RS3 goes around a track faster than the M2, Audi hasn't been well-known for being a "pure driving experience." In the past, Audi steering has been vague, and understeer has been prominent. If you are all about "driving pleasure," you still may want to stick to the M2. However, if you never plan to take your car to the track, we think the RS3 could be the better street weapon. The RS3 would be more comfortable and enjoyable on the street, where 99 percent of owners are likely to keep it. If you're one of those "track day warriors" then stick with the BMW. The Audi RS3 has a nicer interior than the M2 that is much more cutting edge. If you like to keep it simple, go with the M2, but you can't ignore how good the RS3 will be. 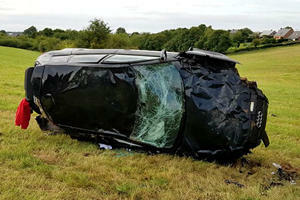 How Did Anyone Survive This Shocking Audi RS3 Crash At 120 MPH? There's no way they could have stopped in time approaching an intersection at that speed. Inline-six, all-wheel drive, just how the driving gods intended it to be.